I absolutely love this quote from the hilarious- and beautiful- Margaret Cho. It is a statement for us all to keep close to the surface of our minds at all times. We are living our lives within a collective consciousness that attempts to put forward the premise that there is only one type of beauty- physical. And that there is only one type of physical beauty- especially if you are female- the one which exists in magazines and the movies. We all know that the idea that the definition of beauty can be narrowed to one limited model is completely untrue. We all know from experience in our own world (not the one created by the media) how ridiculous these notions are, and yet we all allow these false assertions to slip into our psyches. We have all had days where our own minds judge our bodies, our faces, our physicality and even worse, our beauty, with harsh criticism. We live in a collective consciousness that encourages us to spend countless amounts of cash in the diet and ‘health’ industry- diet drinks and foods (which let’s face it, are just poison) pills that contain god knows what but definitely not the miracle you are looking for- vast amounts of time going to the gym to work on machines because apparently even exercise needs machines to do it ‘right’, to go to plastic surgeons if our breasts are ‘too small’, or our noses don’t look like the other noses ‘in’ that season, or our feet are ‘too big’, or our bodies are ‘too fat’ or whatever myriad of reasons that has insidiously been shoved into our subconscious minds. I am not in any way judging anyone who gets plastic surgery or works on their physicality to help themselves feel better- if this helps you feel whole and complete, then that is wonderful and I am happy for you. Truly. What I am talking about is the impetus to have to change your physicality in the first place. The original seed of worry or insecurity about our bodies that we ALL have. That crazy idea that we have all collectively bought into that we are born somehow inherently lacking. This is NOT normal. We’ve allowed it to become the norm but it isn’t and most definitely does not need to be. We have all spent time judging ourselves, and others, harshly and unfairly- and above all FALSELY. I say ENOUGH!! This has GOT to stop. 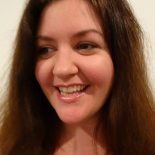 We need to stop judging and bitching, and joining in when others are doing so- or standing by when others are doing so, being complicit. We need to allow ourselves time to change and to come from a place of self-compassion and love but we also need to call ourselves out for not stepping forward and standing up to others, for others and for ourselves. We need to start changing the stories we tell ourselves and each other. We need to start telling each other how much beauty we can see in each and every human. Because there IS such beauty in all of us. I am not just my body. I am not just my mind. I am not just my spirit and soul. I am beautiful and loved, just as I am. Write down affirmations relating to love and beauty and stick them up in places you will see them every day. Keep one in your wallet and take it out to read during your work day. Even on the days where it hurts to say these kind and loving words to yourself because you are feeling the opposite, say them. The old adage of ‘fake it ‘til you make it’ truly does work when it is conscious faking it. I hope you are all holding to the light of love and beauty within your everyday lives, allowing your true spirit to shine through and encouraging the world around you to do the same. We CAN change the collective conscious mind through seeing, acknowledging and feeling the myriad of beauty around and within us. We CAN change this collective conscious mind by being loving to ourselves and loving to others. We are a powerful force when we unite in love! We are all capable of immeasurable love. We are all truly beautiful. We are all worthy of love from within and from the world around us. Hold these statements close to your heart. 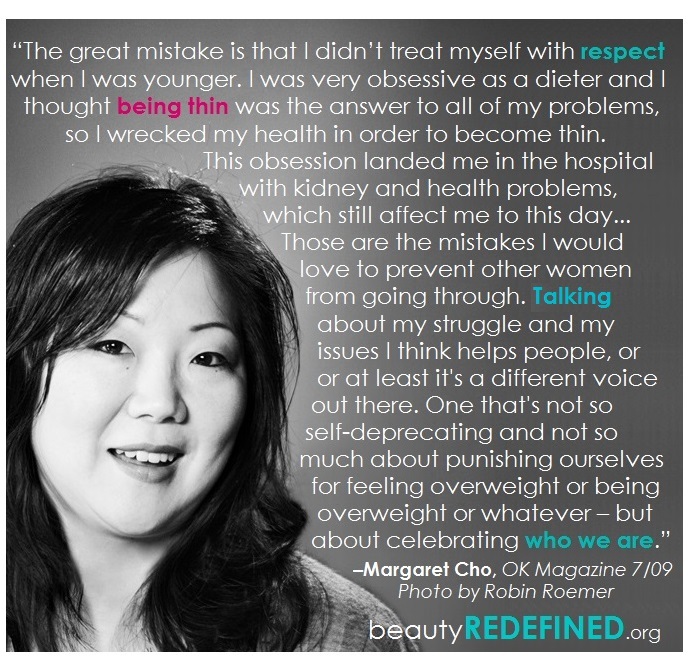 The picture of Margaret Cho comes from a beautiful website I am delighted to have stumbled upon during an image search: http://www.beautyredefined.net/ I am looking forward to exploring it more! It’s great to say I’m beautiful just as I am, but why do we still need to bring beauty into it? Aren’t we good enough if we’re smart and funny and caring? Even when we’re being kind to ourselves we teach people to be beautiful in our own ways, or that beauty comes in different shapes and sizes. Because we cannot shake this concept of beauty beign the most important thing. It’s crazy how much it guides our thoughts. Yes! The characteristics you list are some of what make up what I feel the true definition of beauty is. And there is so much emphasis placed on physicality and a limited viewpoint of that physicality in terms of beauty in the collective consciousness, that I feel we need to ‘take back’ the meaning. To me, the fact we are alive is beautiful. The world around us is beautiful. Beauty is in our hearts and who we all are- physicality has nothing to do with anything in my opinion. Thanks so much for the comment Jay and engaging in the conversation, lovely to hear your thoughts! This entry was posted on June 25, 2015 by laura kilty in Inspiration, Thoughts and tagged beauty, Collective Consciousness, compassion, Diversity, Feminine, inspiration, Judgment, June, Kahlil Gibran, Kindness, love, Margaret Cho, Masculine, Maya Angelou, Patriarchy, Physical Beauty, Quote, Self-criticism, The Beatles, Truth.